Forever Living Products is proud to introduce Forever Vital 5 - our solution to healthy nutrition in one simple pack. 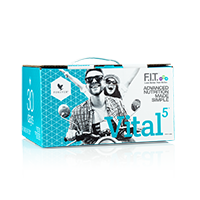 Vital 5 contains x4 Aloe Vera Gel, Forever Daily, Forever Active Probiotic, Forever Arctic Sea and ARGI+. Together these products help to support the Nutrient Superhighway. The Nutrient Superhighway is the transportation of nutrients through our bodies to our cells and tissues. We take in nutrients from our food and the dietary supplements we consume, and the Nutrient Superhighway ensures that these nutrients are delivered to every cell and tissue, plus it removes the waste products our bodies normally generate - all to help keep our bodies functioning optimally. In a nutshell, nutrients move along the Nutrient Superhighway to where they are needed, and wastes are carried to be eliminated from the body.